10 day Masi Magam (February-March) Brahmmotsavam is celebrated in a grand manner beginning on the Bharani star day when the Lord visits the sea. Before His arrival at the sea side Perumal travels through a mosque in Thaikal village where a Nawab was placed in rest. The Lord acknowledges the pooja offered at the Mosque area and visits the palace of the Nawab. This is a very strange and secular tradition followed in the festival. 10 day Chithirai (April-May) brahmmotsavam is celebrated with car and boat (Teppam) programmes conducted in Srimushnam itself. Perumal comes in procession for nine days both in day and night. 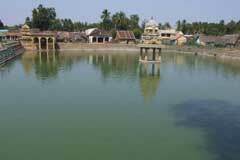 On the 10th day Theerthavari is celebrated in Pushkarini. Each month on the two Ekadasi days, new moon, full moon days and the first day of the Tamil months, Lord Sri Yoga Narasimha is taken on procession in the prakars – corridors- of the temple. 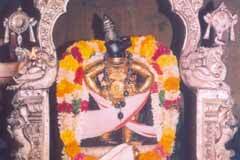 Lord Shri Bhuvaraga graces on Revathi star day in the Chithirai month, the day of his incarnation as Sri Narasimha. Vaikasi Visakam in May-June with procession deity on Garuda, Aadi Pooram in July-August for Sri Andal, 10 day Sri Jayanthi, Navarathi in Purattasi-September-October, Deepavali in October-November, Karthikai Chokkapanai in November-December, 10 nights and 10 days - Rapathu-Pagal Pathu- in Margazhi-November-December, Andal festival, Vaikunda Ekadasi in December-January, Garuda Sevai, Makara Sankranti and Mattupongal in January with Sri Yagnavaraha and Andal wedding festival, Thaipoosam in January-February with Parivettai, Theertha Utsav and Panguni Uthiram (March-April) wedding festival for Perumal and Mother are the festival celebrated in the temple. 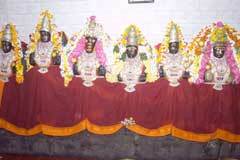 Perumal graces in the temple as swayambumurthi of Salagrama stone. 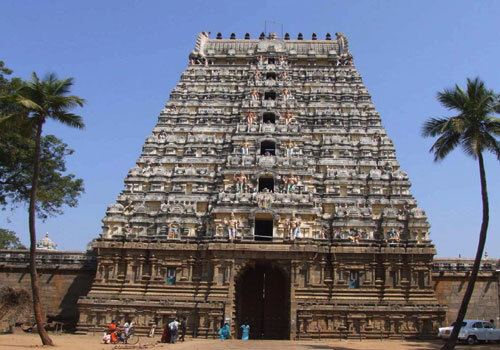 It is noteworthy that 8 Vishnu shrines in the country exist of themselves -1)Sri Rangam, 2) Srimushnam, 3)Tirupathi, 4)Vanamamalai, 5) Salagramam, 6) Pushkaram, 7)Naimisaranyam and 8)Badarikashram. Sri Bhuvaragaswami graces in a standing form facing west while His face faces south. The temple is open from 6.00 a.m. to 12.00 a.m. and 4.00 p.m. to 8.30 p.m.
Sri Bhuvaragaswami Temple, Sri Mushnam, Cuddalore district – 608 703. Procession deity Sri Yagnavarahamurthi graces in the Artha Mandap with consorts Sridevi and Bhudevi facing west. 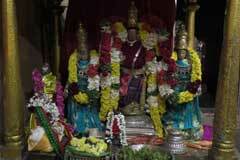 Sri Aadi Varahamurthy and Lord Kanna also grace from this mandap. 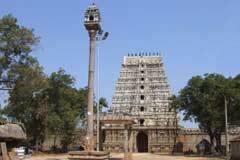 The temple was built by Naikers of Vijayanagaram. According to scriptures and Mantra Sastras, those surrendering at the feet of Lord Varaha Perumal are blessed with eloquence, high position, stable wealth, children, health, and longevity. 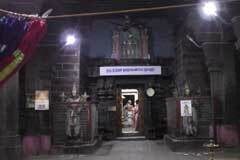 Those facing adverse aspects of Jupiter, Rahu and Ketu are advised to pray the Lord in this temple for relief. Those buying new vehicles do the puja here. Also vehicle involved in accidents are brought here after repairs and before using them again. Realisng their boons, devotees perform abishek to the Lord with white vastras, Tulsi garlands and light ghee lamps. 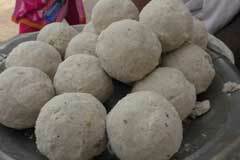 They distribute the Prasad, offered earlier as nivedhana to the Lord to the devotees and also arrange feeding. 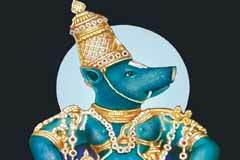 Of the 10 incarnations of Lord Vishnu, Varaha Avatar enjoys special significance. As the Lord appears so majestically with His two hands on the hips, it is believed that worshipping the Lord in this form shall lead to salvation. The Vimana (roof tower) of the presiding deity is called Bhavana Vimana. There is a temple for Kulandai Amman near the northern tower with facilities for the accommodation of the friends of Mother Ambujavalli. Lord Sri Narayana chased the demon Hiranysura in Varaha Avatara – in the form of a divine swine with a menacing horn on the nose – killed him and recovered earth stolen by him. The Lord re-installed the earth on the heads of the divine snake Adisesha as before. He created the Bothi tree, also called Aswath tree and Tulsi from His two eyes and the Nityapushkarani spring from his sweat. He chose Srimushnam for Him and graces the devotees in the name of Sri Bhuvaraga. 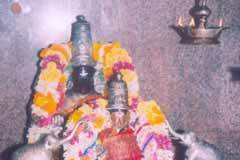 Miracle Based: Perumal graces in the temple as swayambumurthi of Salagrama stone.